All Nippon Airways has taken delivery of its first Airbus A380, from an order of three the Japanese airline placed in 2016. ANA will use its A380s on leisure services to Hawaii, with the first going into service on May 24, the second at the beginning of July and the third next year. 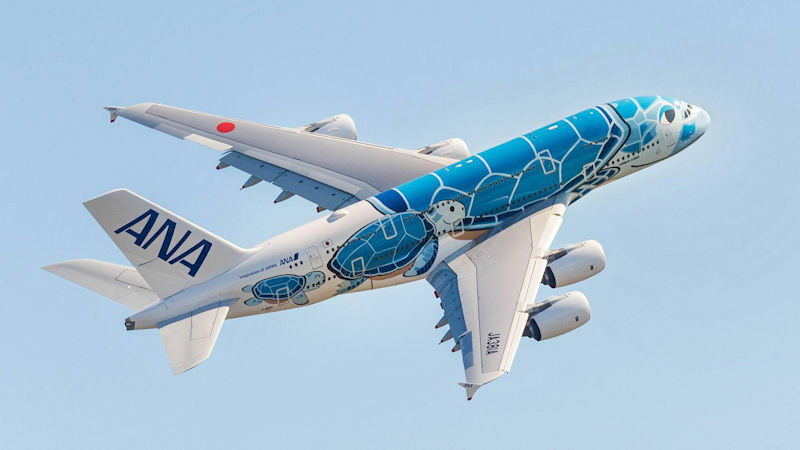 “We believe the A380 will become a game changer for ANA and will enable us to increase our market share by doubling the number of seats connecting Honolulu and Tokyo by 2020,” ANA chief executive Shinya Katanozka said. The newly delivered A380 has a blue sea turtle livery, the second aircraft will be green and the third orange. ANA chose Chihiro Masuoka’s Flying Honu motif in March 2017 after a worldwide open design contest. It was one of over 2,000 entries in the competition. The design features the Hawaiian green sea turtle, a symbol of good luck and prosperity in Hawaii. The ANA aircraft livery represents the blue Hawaiian sky, the emerald green ocean and the orange of the Hawaiian sunset. 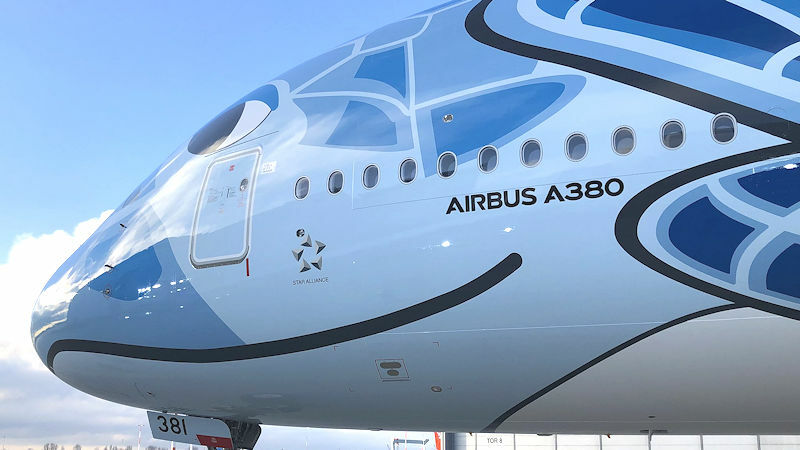 “The Flying Honu is designed to offer unprecedented comfort and convenience and a world of new possibilities to ANA passengers, something that would not have been possible without the combined efforts of the Airbus and Rolls-Royce teams working closely with the dedicated professionals at ANA,” CEO Katanozka said. Airbus said the ANA A380 livery is one of the most elaborate it has tackled, taking 21 days to paint a surface area of 3,600 sq. m. with 16 different shades of blue. ANA's A380s have a 520 passenger capacity, with eight first class suites, 56 business class, and 73 premium economy seats on the upper deck. The main deck will have 383 economy class seats, including 60 couch seats. A couch has three or four seats, giving passengers the ability to lie on the seats by folding up the arm rests.